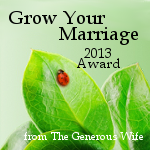 What an honor to have my Tweets receive A Grow Your Marriage Award from Lori Byerly at The Generous Wife! Thanks so much, Lori. Here's wishing you, Paul, and your family a wonderful new year. A well-deserved award, Rosemary! Lori is a smart woman! Thanks, Tammy. I'm wishing you and CJ a very squirrely new year. You do a steady stream of great tweets - thanks!